For an update on how complaints about the dust storm were handled, read our second story on this event. At 2.50pm yesterday, as hundreds of children were getting ready to go home from Haberfield Public School in Sydney's Inner West, Particulate Matter 10 ( PM 10) in the air at the school rocketed from 33 µg/m3 ( micrograms) to 403 µg/m3. These high levels were recorded by a WestConnex air monitor situated next to the school playground. They were triggered by a dust storm from the WestConnex construction site about 200 metres south on Parramatta Road, where a portal is being constructed for the M4 East tunnel. A second tunnel portal is being built about 300 metres west on Wattle Street, Haberfield. Cars and trucks will pour in and out of these portals after the M4 East tollway opens, or continue along Parramatta Road if drivers don't want to pay a toll. WestConnex Parramatta Road site. The school is 200 metres on the left side of the photo. The apartments on right are completely exposed to construction and road pollution. For two hours between 3 and 5.00 pm, the PM 10 averaged 157 µg/m3. Screenshot from Ecotech website 9/4/2018 at 3 pm. 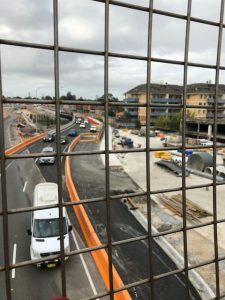 Duststorms have happened before on this and other WestConnex sites during nearly two years of construction at Haberfield, Homebush, Concord, and St Peters. I have seen and smelt them myself in 2017 at the massive WestConnex Stage 2 construction site near Sydney Park. This dust storm was different only because the impact on air quality was captured on a WestConnex air monitor that has been operating on the school grounds since December 2017. I captured the screenshot above at 3.09 pm. At the same time, the vision of suspended dust particles was captured by a resident. (I will post this image later.) Complaints were immediately made to the NSW Environmental Protection Authority. The NSW government is currently deciding whether to allow WestConnex to use 'Muirs', a well-known car dealing site on Parramatta road for a construction site for the third Stage of WestConnex. This site is even closer to the school than the existing construction site. WestConnex originally promised residents that there would be no surface construction sites in Haberfield for Stage 3 WestConnex but changed their plans between 2015 and 2017. If Muirs and other Haberfield sites are approved, it will mean that some 11-year-old students at Haberfield School will have been exposed to WestConnex pollution for all of their preschool and primary school years. Disappearing data and the public's right to know. Under the M4 East approval conditions, the results of the monitoring must be made 'publicly available'. (Condition E8). I'll let readers be the judge of whether WestConnex is meeting this condition. The information in the screenshot above has now disappeared, unlikely ever to appear in WestConnex monitoring reports again. The monitoring, which is a condition that was imposed on WestConnex's planning approval, will continue for 12 months before and two years after the tunnel opens. WestConnex has claimed that the unfiltered pollution stacks will not significantly increase the levels of air pollution in communities around the stack. Haberfield School, which is less than 500 metres from the Haberfield stack, is part of one of those communities. The purpose of WestConnex's monitoring is to demonstrate that WestConnex claims are true, which raises the question of why the Sydney Motorway Corporation that is responsible for WestConnex is in control of the monitoring. I know if I ask NSW Planning officers, they will point out that an independent auditor is going to be appointed. But we know from previous so-called peer reviews of WestConnex EIS that their independence can be illusory. In the meantime, however, the monitors provide a rare glimpse into air quality around WestConnex sites and near major roads. The search engine only produces line graphs, which are not very helpful because they don't provide actual numerical values for daily averages or maximum levels. Whereas most air monitoring sites including the NSW Office of Environment and Heritage publish rolling 24-hour averages ( for example 24 hour averages back from 5 am -6 am; 6 am to 7 am and so on), the Westconnex site only takes a single daily average and it is not even clear from what point in the day that is measured. Monthly reports with summary average details for PM 10 and PM 2.5 are published, but so far only January has been published. Currently, if a member of the public wants to know more about results being recorded by the monitors, they can see nothing at all between Dec 17 and March 10. The public has a right to information that affects their health. Do you think this level of information provision is transparent enough? Do you think it could be described as making monitoring results 'publicly available'? Surely the public deserves better. I took a snapshot at 6.37 am today, April 10. This is what is showing for the monitor at Haberfield School. You can see that PM 2.5 µg/m3 , for which there are no safe levels, is currently 18 µg/m3 and that the daily average has not been below 10 ugm3 this week. What I have noticed lately is that PM 2.5 levels have tended not to go down to levels below 6 µg/m3 , even during the night as seems to happen at most other Sydney air quality monitors. It looks like the PM 2.5 annual average at the school is currently at about 10.2 µg/m3 and has been steadily rising. Currently, it has not been below a daily average of 10 µg/m3 for more than a week. 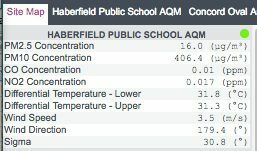 So far this year, the Haberfield School monitor has registered the highest average levels of PM 2.5 of six WestConnex monitors. After four months, the annual averages at four of six monitors is so far tracking above the national annual average limit of 8 u/gm3. Haberfield Public School monitor snapshot 6.37 am on April 10. At Haberfield School, the annual average PM 10 level is above 20 µg/ m3. This is below the national limit for 25 µg/m3 but above 20 µg/ m3, which is the standard the Victorian government adopted for its limit in 2016. It's now Tuesday morning and the line graph hasn't moved to take account of Monday. As for yesterday's dust storm, if residents didn't have the photos and the screenshots, you would never even be able to show it happened. Ecotech won't talk to the media so I submitted a series of questions to the Sydney Motorway Corporation ten days ago. I am waiting for answers. You can follow the monitoring results yourself at http://airodis.ecotech.com.au/westconnex. I just checked the website at 7 am and the PM 2.5 and PM 10 results at Haberfield School have risen slightly. I'm off to the protest at Parramatta Road near the school. P&C member Sherrill Nixon, one of the parents who organised this protest, said in a media release yesterday that parents were already reporting increased cases of asthma and other respiratory illness as a result of dust caused by construction at three WestConnex sites near the school. I agree it is unbelievable that our wealthy Australian society cannot manage better urban planning than what we are witnessing at this and other WestConnex sites. But after three years of closely following WestConnex, I find it be sadly very believable. And it's not just the school. If the PM10 was 405 µg/m3 at Haberfield School yesterday, what was it at Peek A Boo childcare centre that fronts directly onto Parramatta Rd opposite the construction site? When the wind blows from the north, what is the air quality in the apartments that you can see in the photo at the top of the story? Before WestConnex, hundreds of residents living in these apartments were protected from the roadside pollution by other buildings and trees. Not only were those buildings stripped away but they have been left within metres of a congested road and construction site, without even a noise wall. For more on how WestConnex Stage 3 will worsen air pollution near other schools and childcare centres in Sydney, read this story. Since we published this story, residents complaints about the lack of transparency in the narrow 30-day search range led to SMC opening up the search engine so you can now search for the entire period of the monitoring. This shows that citizen pressure can make a difference.